This carving is called ‘Interconnection’. In nature, all things are interconnected and each part of an ecological system effects the rest. Humans are not exempt from this universal truth. Through understanding the law of cause and effect, we can create the special causes in our own life that lead to deep inner peace and harmony. This is symbolised in the motif on the front of the carving. The two elements of the koru design make the whole design. The design coming down the shaft represents a spear of wisdom that is penetrating deep into our own mind. 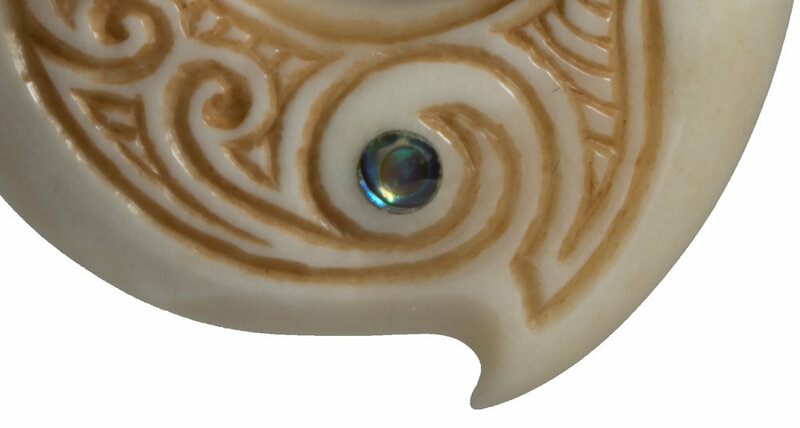 Our mind of wisdom is represented by the inlay of pāua in the centre of the carving. The motif on the back represents the a sword of wisdom cutting away our negativity.